Al Jazeera just published an astonishing report on the after-effects of the BP oil disaster, and it's not pretty. 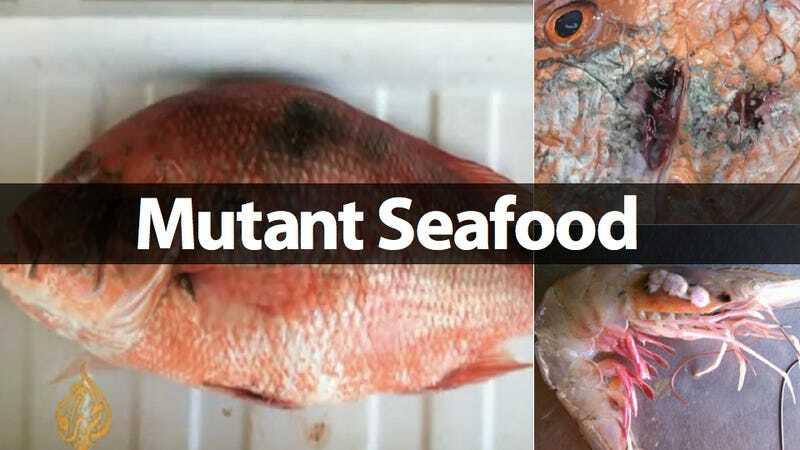 There are an alarming number of deformities in sea creatures: mutated shrimp, fish with sores and lesions, eyeless crabs and more. It's unlike anything local fisherman have ever seen. Shrimp with defects on their gills and "shells missing around their gills and head"
The fishermen, scientists, and seafood processors who talked to Al Jazeera are all in unison: They've never seen this before. Some have worked in and around the Gulf for over 20 years, and most have seen thousands and thousands of fish. This is the first time they're seeing the mass mutation and destruction of seafood. And it's not just the obvious deformities. Tests of the oysters that wind up on our plates have shown elevated levels of nickel and vanadium according to the Natural Resources Defense Council. And the jury's still out on arsenic, cadmium, lead and mercury levels. Scientists and fishermen are pointing to the 2010 BP oil disaster—and the dispersants and chemicals used in its cleanup—for creating these deformities. Specifically, the solvents used to clean up the spill are powerful enough to dissolve oil, grease and rubber. That's great for cleaning up an oil disaster, but terrible for the environment and worse for humans, not to mention the toll taken on anything that lives in the Gulf. And the thing is, these dispersants have always been known to be mutagenic. The chemicals very probably altered the genome of sea life. Prior to the spill, only one tenth of one percent of Gulf fish had lesions or sores on them. After the spill, according to the University of South Florida, many locations showed 20 percent of fish having lesions with as much as 50 percent in other areas. What exactly is the cause? Dr. Jim Cowan of Louisiana State University believes that chemicals called polycyclic aromatic hydrocarbons (PAHs), which the EPA terms as "a group of semi-volatile organic compounds that are present in crude oil that has spent time in the ocean," are causing the majority of problems. Fish and other sea creatures are being exposed to PAHs, which affect both the immediate health of the fish itself and the victim's genome. On top of that, the dispersants used to clean up the oil spill are known to be toxic to humans. Symptoms of exposure include "headaches, vomiting, diarrhea, abdominal pains, chest pains, respiratory system damage, skin sensitization, hypertension, central nervous system depression, neurotoxic effects, cardiac arrhythmia and cardiovascular damage." Even more damningly, it can disturb the growth and development of a fetus. Essentially: BP is cleaning up a spill with acid, and acting surprised when the floor disappears. The FDA, EPA and NOAA (National Oceanic and Atmospheric Administration) all refused to comment on the awfulness that's happening in the Gulf. BP, the company who created this mess in the first place, refuse to take the blame, saying the seafood in the Gulf is "as safe now as it was before the accident." The evidence, of course, indicates otherwise. The Gulf of Mexico provides nearly half of the seafood caught in the US (40%). With its inhabitants dying or suffering mutations before they're caught, it looks like seafood shortages are inevitable. According to various fishermen, brown shrimp catch has dropped by two-thirds, white shrimp have been wiped out and some fishermen's seafood catch are ten percent of what they normally are. Seafood, as America knows it, has changed. And without the proper funding or commitment or BP accepting the blame, these effects might last longer than anyone thinks. "We're continuing to pull up oil in our nets. Think about losing everything that makes you happy, because that is exactly what happens when someone spills oil and sprays dispersants on it. People who live here know better than to swim in or eat what comes out of our waters."